No matter how old you get, there is always something a little magical at the idea of taking a trip to a theme park. Who says you can’t excel at being a human adult while also shrieking at the idea of drinking Butterbeer at Hogsmeade? 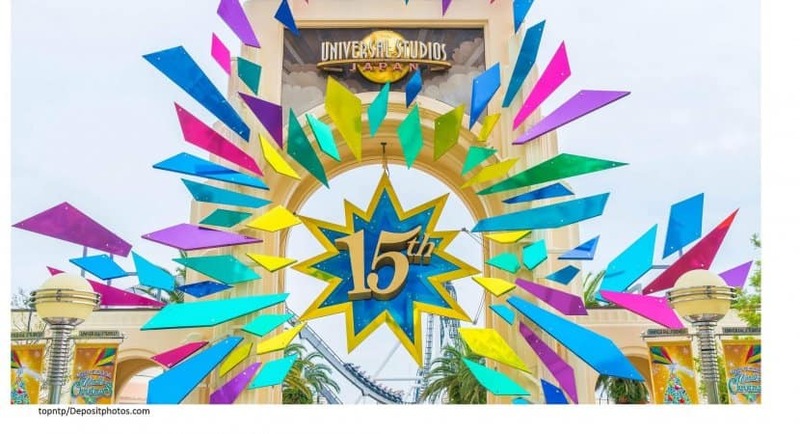 If you’re going to indulge in your child-like delights, Universal Studios Japan is an excellent place to do so. But, where to stay during your visit? Here’s a list of the 5 best hotels near Universal Studios Japan to consider when conducting your search. And the sooner you have that sorted, the sooner you can go get a freaking wand from Ollivanders (I promise, there are more attractions besides the Wizarding World of Harry Potter at USJ…but do there really need to be?). The first on the list appears to not only be one of the closest hotels to USJ, but also seems to be the most theme park-themed (too much theme-ing?). They offer Minions-themed rooms (the photos are adorable) and other colorful concept rooms to pick from if you want to treat the kiddos to something memorable. They also offer ocean-themed rooms for those in more of a nautical mood. Or, there are rooms on the “Regular Floors” you can choose from that are more neutral in theme. The hotel is perfect if you’re looking to get in and out of USJ quickly (this is especially convenient if you’re traveling with kids). Being right on Osaka Bay also adds another layer of charm to the experience, as do the shops and restaurants, which are all close by. The JR Universal City Station is about a 3-minute walk away. If you’re looking for another adventure, there’s a fast shuttle ferry that will get you from the Universal City Port (near the hotel) to the Osaka Aquarium in 10 minutes. Now, if you’re looking for something a bit more affordable but just as close to the park, Hotel Keihan Universal Tower may be for you. The overall feel of this hotel is a little more “adult” and less kid-oriented, so this can be a good option if you’re on a romantic getaway or are planning to travel with friends or other adults. However, it is suitable for families as well. The Garden restaurant even prepares food with kids in mind. This includes items like petite hamburgers, french fries, kids nuggets, a chocolate fountain, and cotton candy (basically, all the foods kids love). This is the largest of all of the official Universal Hotels. It boasts a beautiful view of Osaka from its natural hot springs on the 31st floor as well as from the sky restaurant on the top floor. The hotel is just in front of JR Universal City Station and is a 2-minute walk to USJ. One of the best things about this hotel is the view. Book a room up as high as you can for some excellent photo-taking opportunities. This hotel’s website reads that it’s “your gateway to a journey through time and space,” so you know they mean business. This is the closest hotel of all the official Universal hotels and offers spectacular views of the park and its surroundings. You can choose a room based on its floor level type: floors 4-7 are “Standard”, 8-25 are “Superior”, while 26-28 and “Luxury”. Of course, the higher you are, the better the view. The hotel’s theme is quite charming. It’s based on the idea of a journey through America’s different time periods, from roughly the 1800’s to beyond the present and into the future. The elevators are even made out to be time machines (!). Someone got really into decorating this hotel. The hotel lobby has a monitor that shows the wait times at the park attractions. For people who always need a schedule (cough, me) and want to know how to plan ahead of time, this can bring a great sense of control to the (fun!) chaos. If you’re looking to spend a little less but aren’t willing to let go of staying close to the park, this hotel is right up your alley. The rooms are a little more affordable, but you’ll still get the experience of staying near a theme park. Universal CityWalk’s shopping area is nearby, which has a variety of shops and restaurants to check out. The chain Ootoya has a restaurant on the 5th floor, offering traditional Japanese comfort food, while a McDonald’s is right next door to the hotel for those with more Western appetites. A great feature for those who didn’t want to lug all those souvenirs from the park back to their hotel room is the Universal Studios Store. You can check the store out and not feel rushed to pick something out like you might at the crowded souvenir store inside USJ. Rooms come in a variety of sizes, but the largest options for families are the corner family room or the deluxe family room at the top of the hotel. Keep in mind that these rooms have a maximum occupancy of 4 people. Two connecting rooms for available for groups or families with 4-6 people in their party. Overall, this is a great option if you’re looking for your basic needs to be met during your stay and you’re happy without natural hot springs or other extravagant options. Directly next to the JR Universal City Station and a short, few minute’s walk to USJ. Immediately next to Universal CityWalk. If you’re hungry for a late-night snack after all the restaurants close, a vending machine room with hot drinks and food options is on the 3rd floor. With its grand opening in August 2017, this is by far the youngest of the hotels near USJ. But what it lacks in age, it makes up for in class. Out of all of the hotels near USJ, this is by far the least theme park-themed. This is where I would go if I wanted a quieter getaway and a break from the noise and the hustle of a day inside USJ. This hotel is more focused on providing a relaxing stay for its guests, offering a spa, open-air baths overlooking Osaka Bay, and incredibly comfortable bedding. If you want to be within walking distance to USJ, but don’t necessarily want to be bombarded with Universal-themed colors and sounds during your whole stay, this is the perfect place to unwind. As far as rooms go, the sizes are much more standard, accommodating singles and couples, with few options that would allow for small children. If you want to get really fancy, you can get a suite that has a private open-air bath with a gorgeous view if you’d rather not bathe around others. All of the rooms are sleek, simple, and the beds look downright comfy. In keeping with its modern Japanese feel, breakfast options offer mostly Japanese style food. So if this turns you off (and you should at least give it a try, the food there looks incredible), there is always McDonalds! Also directly connects to the JR Universal City Station. A 5 -10-minute walk to USJ, and near to the Universal City Walk. Honestly, I think the hotel is an insider’s tip in itself. It’s brand new, so it’s perhaps not quite as popular as the rest of the big, Universal-official hotels. It looks like an amazing getaway if you want some more peace and a chance to truly relax. Great, after all of this discussion of planning, now I’m hankering for a trip to USJ. Enjoy your trip! Get a Butterbeer for me, please, and enjoy Hogwarts! I’m with you in spirit…just like Harry’s parents. Kristen is a Michigan-born, Brooklyn-based freelance writer. She studied abroad in Japan during college and realized that it was, in fact, possible to fall in love with a country. She lived there after college, teaching English for a year deep in the countryside of Shiga Prefecture. After then traveling the world as a Japanese-speaking flight attendant for two years, she finally planted her feet on the ground. Kristen enjoys her days reading as many books as humanly possible, writing as much as she can, and traveling back to Michigan to see her lovely family at any opportunity.